Hi everyone! Sorry, it’s been a looong time since my last post. I’ve been away on business then away again for Comic-Con. Now I’m finally home and will go back to the regular schedule of postings. One Friday night, K and I tried to grab a bite at Tony’s, but was told there would be a 2 hour wait. So, we ditched that plan and decided to stumble upon any Italian place in North Beach. While walking along Columbus Ave, a waiter reeled us in by saying “Real Italian food! Our staff is from Rome and we make our own pastas. Come on in!” How could we resist? We were quickly seated at one of their outside tables in front of the restaurant for easy access to people watching and enjoyed a tasty meal under the city lights and a cozy space heater. The service was amazing in the beginning, but then it slowed down towards the end of the meal. It took about 3 tries before we could waive down a waiter to bring us a box and our check. Despite the lacking service, I love the ambiance of the restaurant and the option to sit at a table on the sidewalk, although other restaurants in North Beach have the same option. San Francisco’s “Little Italy” does its best to give visitors a taste of Roma. The good thing about Colosseo is that now, you can get a seat quickly since the restaurant opened just a few months ago (they took the place of Figaro). I expect a line out the door once more people discover it. I am very impressed with the food. Their ingredients are undoubtedly fresh and their menu is so extensive, I feel like I need to come back at least 20 times to try everything that caught my eye. They must have 40+ different pasta featured in the menu and being the indecisive person that I am, it took about 10 minutes before I decided what to order. It wasn’t too pricey either. Total bill without drinks and tip was about $50. Arugula with prosciutto, burrata cheese and aged balsamic vinegar – This. Was. Amazing. I swear… It is probably the best salad I’ve ever had. It outshone the entrees! And, YES. A salad can be that good. The arugula was so fresh and peppery and the ball of soft cheese sitting on top of the bed of greens was so creamy and mild. Burrata cheese is a cheese made from mozzerella and cream, giving it a smooth buttery texture. This cheese is the star of this dish. 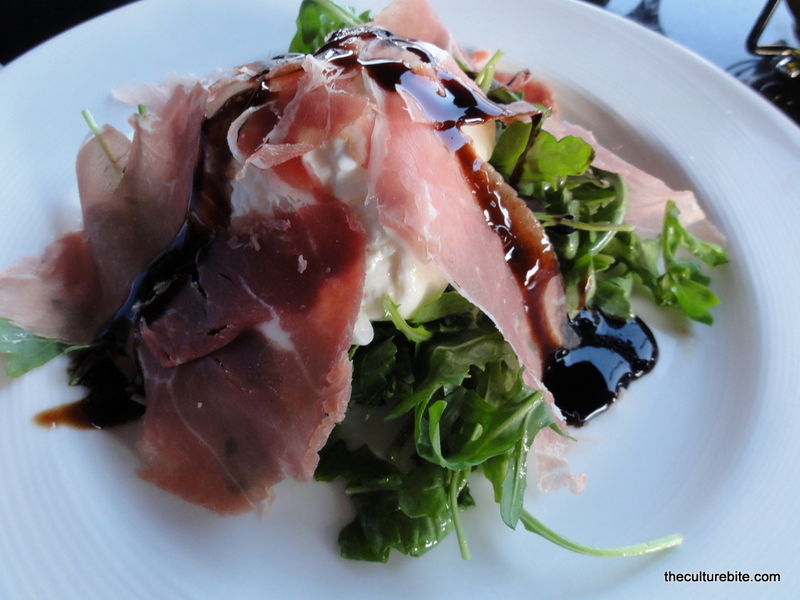 The salad was topped with some high-quality prosciutto and sweet, aged balsamic vinegar. Linguine with Seafood – This, too, was delicious, but I don’t believe the pasta in this dish was homemade because all of the noodles were the exact same size in shape. The sauce was brothy and had a hint of wine. Great dish for bread dipping. I could be wrong though. Also, I was very surprised when the bus boy asked if we wanted cheese on top because you normally do not add parmesan to linguine/seafood dishes. Gnocchi al pesto – Even though it took me so long to figure out what I wanted, I ordered what I usually get at any other pasta restaurant – gnocchi al pesto. The gnocchi is definitely home-made. The pasta had bite and was super rich with the different cheeses and olive oil. All-in-all, I was very pleased with the meal for even just dropping in without looking at reviews prior. I’d go back just for the salad and maybe try their lobster raviolis.